James Plympton was born in Yeovil in the spring of 1875, the son of labourer Richard Plympton (b 1837) and glover Mary née Rowe (b 1832). In the 1881 census, in South Street, Richard and Mary were listed with their children; Mary A (b 1866), Richard T (b 1872), 6-year old James and Henry J (b 1878). In the 1891 census the family were listed at 12 New Prospect Place - a long terrace of tiny cottages, little better than slums and occupied by the very poorest families - also known as 'The Colony' and Jenning’s Buildings. Richard and his two elder sons, 18-year old Richard and 15-year old James all gave their occupations as general labourers. As a sidenote, James' neighbour was 13-year old Richard Brown who would also give his life in the Great War. In the autumn of 1899 James married Elizabeth Maria Holt at Yeovil. They were to have six children; Dorothy V (1900-1905), Rose (b 1903), James, Frederick (b 1906), Lionel (b 1907) and Ernest (b 1909). In the 1901 census James and Elizabeth were living at 1 Dodham Cottages, another poor area of Yeovil, with their daughter Dorothy and James' widowed mother Mary. 25-year old James gave his occupation as a bricklayer's labourer while 22-year old Elizabeth gave her occupation as a cloth ripper. By 1911 the family were clearly somewhat more prosperous and had moved to 9 Chant's Path where James gave his occupation as a jobbing mason. James and Elizabeth later moved their family to 20 Queen Street. James enlisted at Yeovil, although the date is unknown, and joined the 7th (Service) Battalion, Somerset Light Infantry. From his Service No 12210, and his age of 40, it seems most likely that James enlisted late in 1915 as a direct result of the Derby Scheme. By spring 1915 it had become clear that voluntary recruitment was not going to provide the numbers of men required for the continued prosecution of the expanding war. The Government passed the National Registration Act on 15 July 1915 as a step towards stimulating recruitment and to discover how many men between the ages of 15 and 65 were engaged in each trade. The results of this census became available by mid-September 1915. On 11 October 1915, Lord Derby was appointed Director-General of Recruiting. He brought forward a scheme five days later, often called the Derby Scheme although officially it was the Group Scheme, for raising the numbers. It was half-way to conscription. Although the 7th Battalion had left for France on 24 August 1915 it is probable that James was still undergoing training at this time. 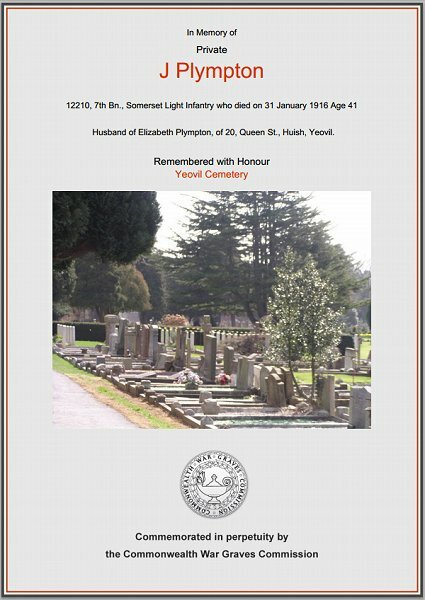 Although no details are available, James died in England on 31 January 1916. He was aged 41 and left Elizabeth a widow with five children to raise. 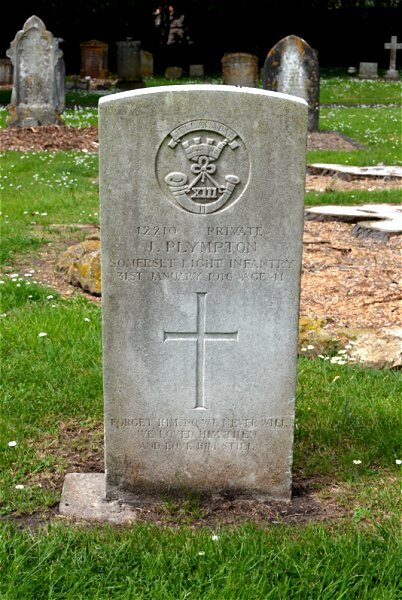 James was buried in Yeovil Cemetery, Grave B.2728. The Commonwealth War Graves Commission headstone on James' grave. Photographed 2014. The Commonwealth War Graves Commission certificate in memory of James Plympton.